Inder Loves Folk Art: On economic recovery and the apple-picking dress. When my lawyer work load goes through the roof, I may actually manage to keep sewing a bit here and there, because sewing keeps me grounded and sane, but blogging goes in the toilet. There is only so much time I can stand spending typing away at a computer in a week, apparently. Actually, I can stand quite a lot of time, it turns out! (Hello, internet addiction!) But there is a limit and I've been hitting it. I wish I could say my workload was lightening up, but it's not. This is actually good news in a way. I'm a land use attorney, so my work load ebbs and flow with development. The economy is thawing out everywhere. I think most people feel the load of the deepest recession of my lifetime lightening up a bit, even if we are still complaining about rising costs and stagnant incomes. Economic development is actually a thing again. It's funny to say that - twelve years ago, when I became a land use/local government attorney, I would have looked at you incredulously: "When is economic development ever not a thing? This is California!" Remember, property values just keep going up and up and up, right? Sure thing right there. To my former self, I say: "Oh, honey." And with that, we grow older and more experienced and more jaded. So, yes, the economy is thawing. THANK GOD. I have been so blessed to have a job throughout this shitstorm. Our house was underwater for a solid seven years, but we paid the bills. I admit, I wondered a few times if my choice to practice this area of law was a mistake (clearly, bankruptcy law is where it's at! that, my friends is what we call gallows humor). But I was lucky to graduate from law school when I did, back when there were jobs aplenty, and I entered into the recession with years of experience under my belt. I have the deepest sympathy for newer attorneys who graduated into a world-without-jobs; a lot of my resilience is just pure luck and timing. I wonder what impact this "Great Recession" will have on our generation? Will we be scarred like my grandparents' generation was by the Great Depression? Will we stash our money under our mattresses? Because we know, banks can still fail messily. Markets are fickle and cruel. Will I ever feel like home-ownership is an "investment" again? Will I be warning my poor grand-kids: "Don't buy more house than you can afford! You never know when the market might crash again!" while they roll their eyes at old granny? Will I save every rubber band and newspaper "just in case"? Only time will tell. I definitely feel like these hard times have changed my outlook, but maybe that's just middle age creeping up! Where was I? Yes, my workload, which is so dependent on new development or redevelopment, is going through the roof! Yay? "Mixed feelings" doesn't even cover it: Relief, a certain amount of nerdy and lawyerly joy, excitement about hopefully seeing some changes in my city (both the one I work in and the one I live in), caution, uncertainty, wanting to be optimistic but not daring to be, a little bit of exhaustion. I think so many of us are experiencing serious budget-burnout. For crying out loud, when will be able to SPEND SOME MONEY? Years of economizing and driving beater cars and jerry-rigging fixes to the roof. So much deferred maintenance! It's exhausting! The recession supposedly ended five years ago, but we see the results of the foreclosure crisis all around us still. Frugality seemed fun there for a while, but the shine is seriously worn off. I'm ready for a spending spree. Okay, thank you for indulging me. Recently I've been thinking about blogging, and my current blogging slump, and I decided that I need to talk about what's on mind a bit more, rather than limiting my posts to just the more shallow stuff (pretty sewing and crafting!). I used to actually have opinions on my blog! Ha. I think there's the fear of oversharing on a blog, which is a pretty public space after all. But there needs to be a balance. With that, my first sewing project of 2015! The Apple-Picking Dress! As y'all know, I am trying to work through my oliver + s stash this year (actually, we're in year # 2 of that project), and this pattern has been in my stash for well over a year now. This pretty pink calico has been in my stash for at least as long. As you can see, "Project: Make Pink Clothes For Maggie" continues in earnest. 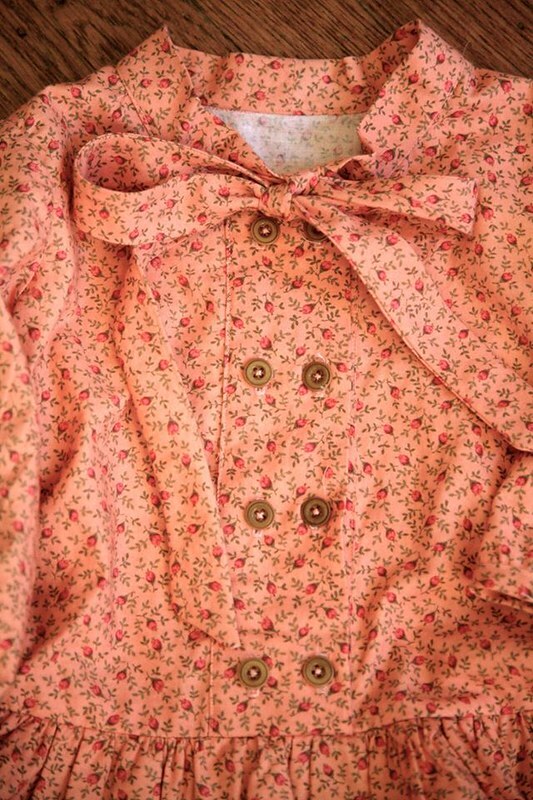 This dress is a more complicated make, with the neck bow, placket and little sleeves. And frankly, the end result is a bit on the fussy side by my standards. The amount of floof (floof = ruffly, puffy, floppy) - it's a bit out of my comfort zone! When I finished it and put it on Maggie, I couldn't help but feel that she looks a little like an old lady in a 1980s dress (it needs shoulder pads!). I think the long sleeves and double ruffle skirt may be just a bit ... much. Of course, Maggie's choice of accessories probably increased this effect. 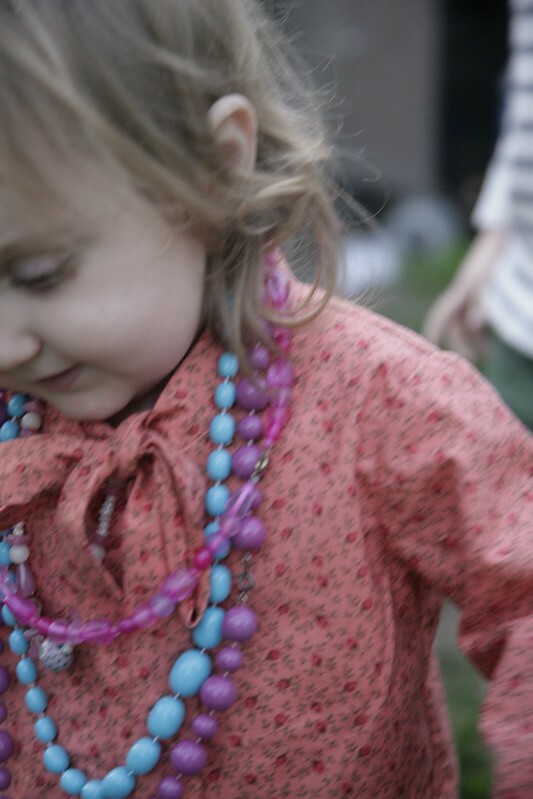 She's very into her necklaces these days. I really admire the vintagey style of several bloggers who have really made this dress shine, but I just don't know that it's "me." Perhaps I would like it better in a less fussy fabric, or perhaps it's just a bit too floofy for me. At any rate, it is always fun to sew a new oliver + s pattern, so I don't regret it. I just don't know that I'll be making a ton of these in the future (that said, my very ruffle-centric niece would probably love this dress). Of course, Maggie would be adorable in a paper sack, so little old lady dresses? No problem. Initially, as you can see, I used covered buttons on the placket, but they were a MASSIVE FAIL. I don't know what I did wrong, but they started falling apart almost immediately. I had pushed them together with all of the finger strength I possess, but it clearly wasn't enough. I decided to scrap them and switch them out with some more casual wooden buttons which I actually like quite a bit better than the covered buttons anyway. Stupid covered buttons: I spent so much time making them!! 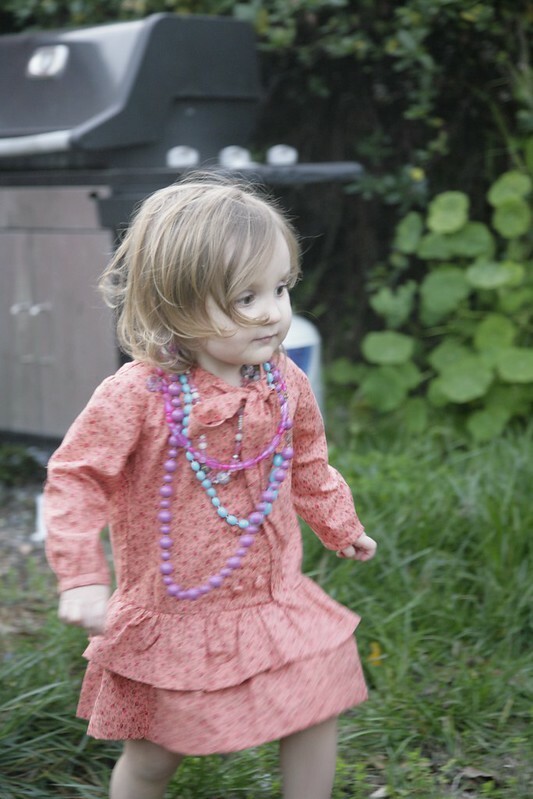 After I finished sewing the new buttons on, I showed the dress to Maggie, and she said "I don't like it!" and turned away. Huh. These opinionated children! I've put it in her drawer and we'll see if it gets any wear. It is pink, after all. Are you feeling the economic recovery yet? Or maybe you never felt the recession to begin with? Do you feel like the years of frugality and austerity changed you? And what's your vote: Cute, or old lady? I'm sorry to hear the past few years have been so difficult. We are lucky in Australia to have been protected from the effects of the recession thanks to the mining boom (although god knows how we'll fare once the land has been stripped of its resources...). Still, I do know what it's like to live on a shoestring budget without a cent to spare, and I know what a relief it is to at last have a bit of spare cash to spend and to be able to treat yourself! Can I vote cute and old lady? 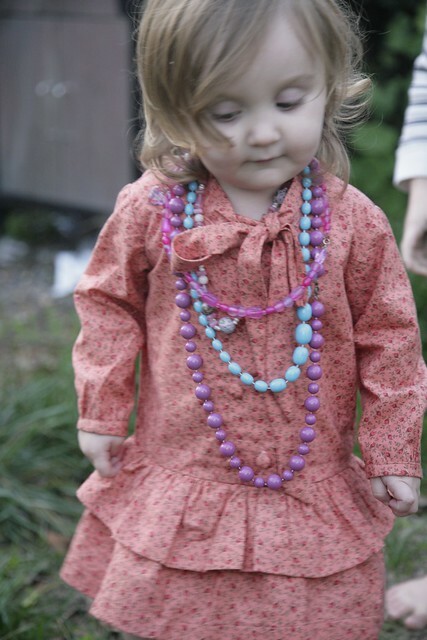 Luckily at Maggie's age she can totally pull off ruffles, floral and pink without being too cute! And ugh to getting older and wiser and realizing that economic problems don't just happen to other people. Love the dress on Maggie. It's a pattern that I wasn't entirely sold on, but then really enjoyed making. I've come around and really like the one I made but now my daughter won't wear it. Sheesh. We've just handed over an enormous sum to a lawyer who we've used for a boundary dispute with a dumbass neighbour. Happy to be keeping your kind in work! As soon as the fence is successfully built there'll be a conga line party (raised middle fingers optional) down the eastern side of our property. Everyone's invited! Glad that work is picking up for you, Inder! I like hearing about other things besides sewing so keep on with sharing non-sewing thoughts. ;) Yeah...this dress was never one on my must have list. I didn't purchase it and haven't had any regrets. It's just not my or my kids style. 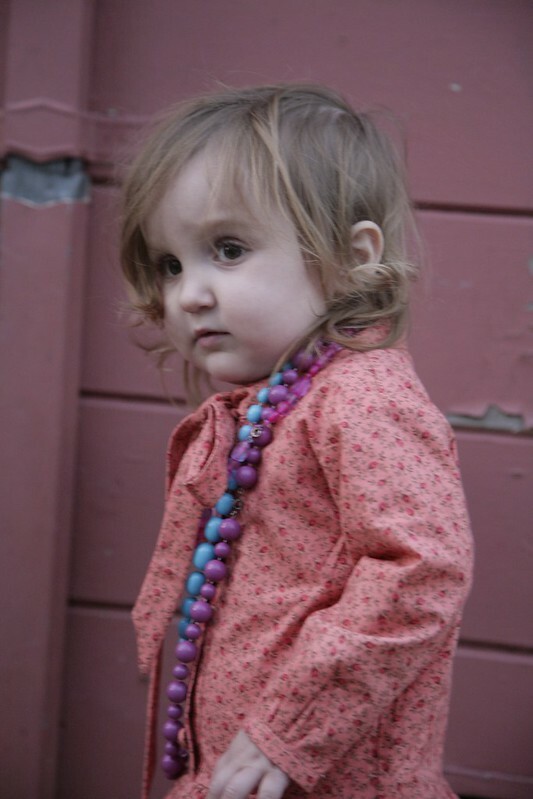 That said, it's adorable on Miss Maggie...beads and all! I have to agree with Cindy above and say it isn't really my style, but it is amazingly adorable on Maggie. She looks so sweet and huggable in it - like a little doll. It's super cute on her! I really like when bloggers blog about other things than just sewing. I enjoyed reading more about what you do. I'm not one that likes reading oversharing online. But I think bloggers could share more, without oversharing, you know? I think Maggie's layered necklaces and general adorable ragamuffin style tone the dress down plenty but yeah, there's a lot of floof going on in that pattern! Inder I love your sewing but I also love when you share what's on your mind! I'm glad that things are shaping up around you. Maggie is adorable in anything, but I've always felt that this dress just isn't quite my style. Plus all those button holes. But it's pink and so sweet and I hope that Maggie gets lots of wear out of it! Awesome post, Jed read it over my shoulder.